I want to get into a habit of streaming whenever I’m working on my own projects so here is my first one. I will try to record it and upload it to youtube also. 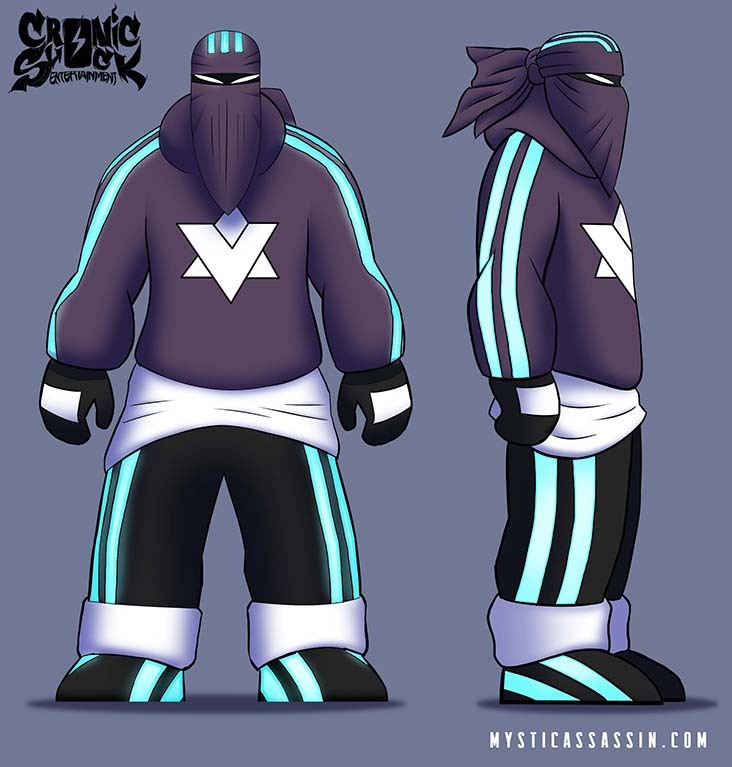 I’m gonna be using Spline for the animation in Mystic Assassin. This has many benefits over framed animation such as being able to animate programatically, ability to reuse animations across characters and modify character’s weapons and outfits etc among other things. 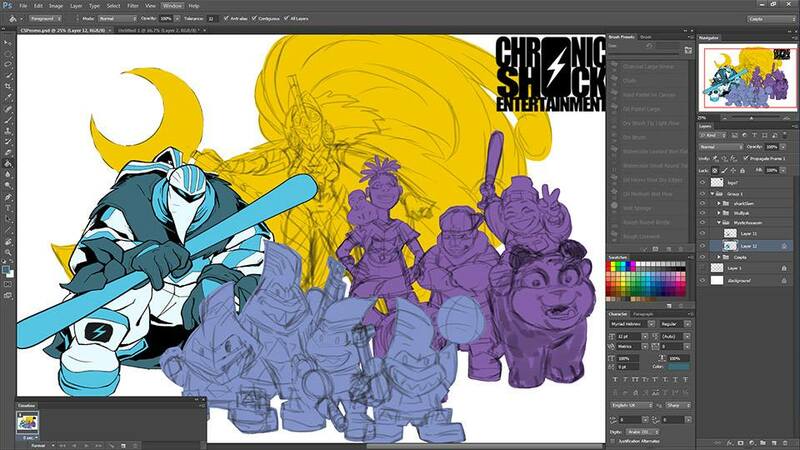 So here is step one: draw a character and break him to pieces. 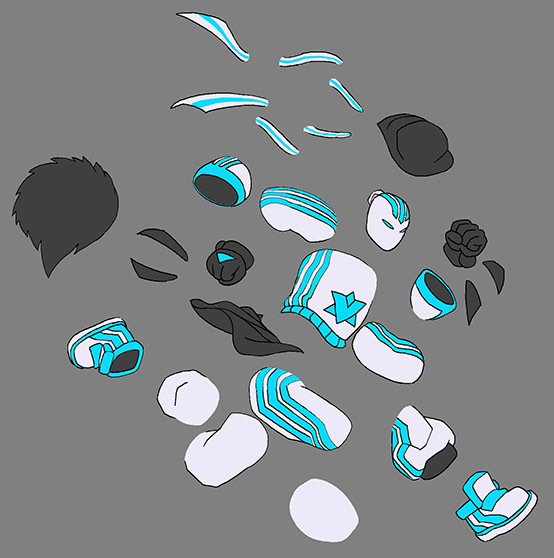 This will just be a temporary animation so I’ll just be using basic pieces for now. Later on I’ll be adding some frame based pieces to make the cloth flow with his movement etc. Stay tuned for the animation preview! I’m playing with the idea of having some kind of pixel art style for the characters. I’m thinking Street Fighter Alpha style but with some gradient glows etc that don’t need to be pixelated. The reason I’m interested in trying this style is that I kind of want the game to have a ’90s’ vibe. So Sega Megadrive, Super Nintendo, Image comics like Spawn, Uncanny X-men and animated cartoons. I want to mix this up with a modern soundtrack with the sounds of trap music and dub. Here’s my first try at some pixel esque art. I think I’ll do a few more to try different looks. Here’s the basic concept for the player character. There are still a few things I want to change but this is the general idea. 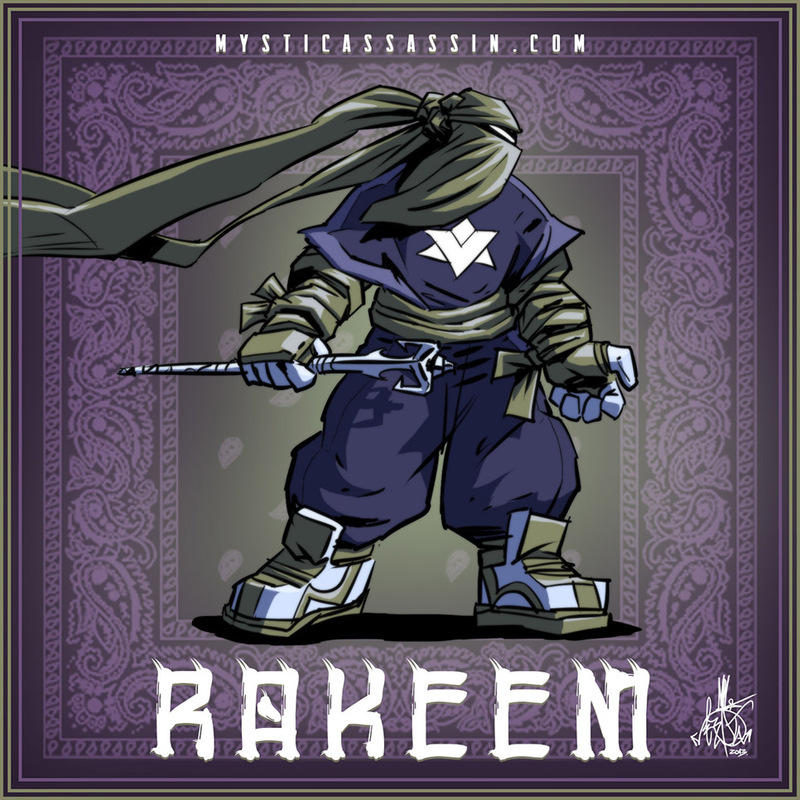 On his staff are seven chakra stones that can be charged for different abilities. The general concept for the game is still coming together and I want to do some more concept art and some basic game mock ups to get a better idea of what to code. 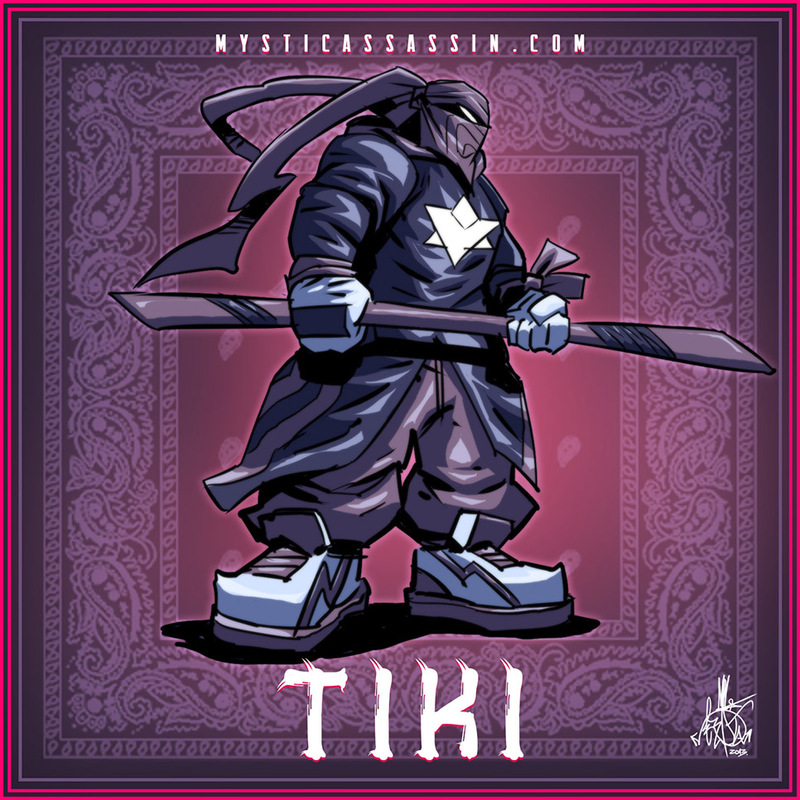 The character I would best describe as a cross between a street ninja, a shaolin monk and a shaman. Together they form a pretty potent mix of potential abilities and a core philosophy that the character adheres to. 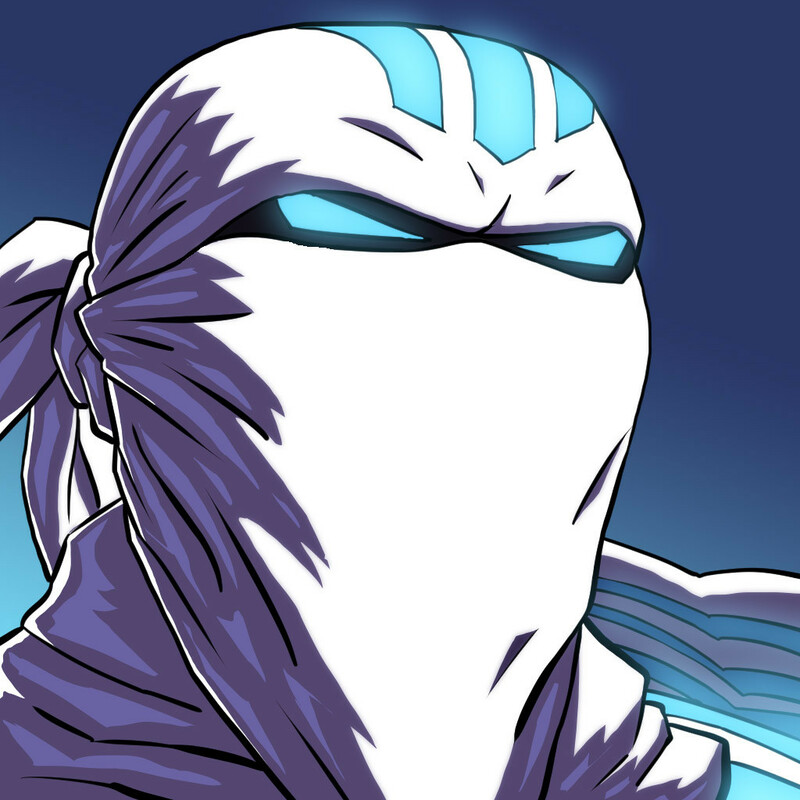 I’ve also been think that I want to stick to my comic book roots so have been thinking of ways to incorporate digital comic techniques to tell a short story within the game. Anyway here is the latest art! I’m working on concept art at the moment and working out what kind of art style to use. I’m keen to use something akin to pixel art but without the pixels. By that I mean using a limited colour palette and keeping blending to a minimum. Here’s a poster I just finished using a more comic book style. Planning to do alot more experimenting as have been playing through sword and sworcery and am blown away by what they achieved. Here’s a bit more art. Just been trying to extract the game I want out of the art. I know the look and the vibe but still haven’t settled on exactly how the game will be. I thought I had it worked out but it still seemed a bit too vague for my liking. 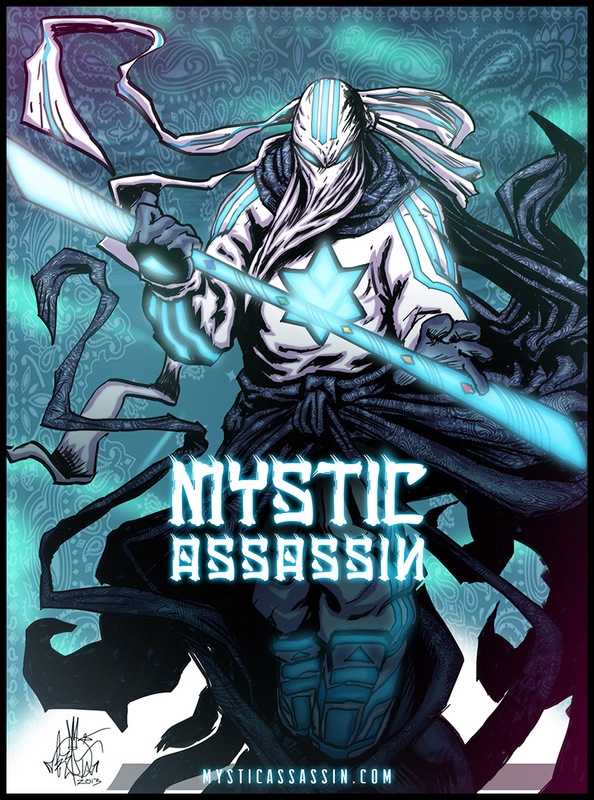 I want to stay true to the original idea that spawned the name Mystic Assassin a few years ago. 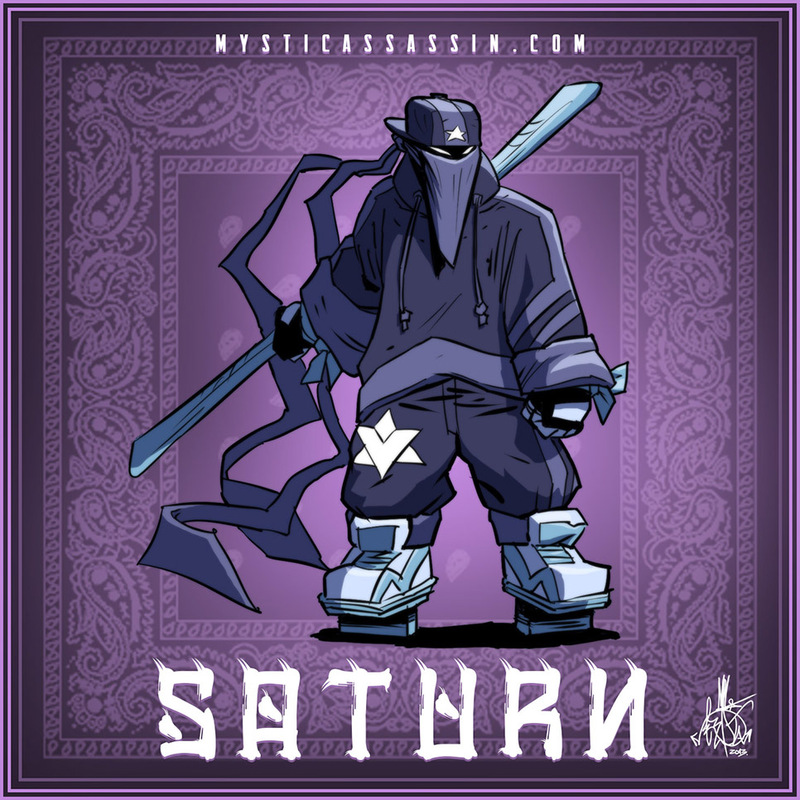 Basically a Wu-Tang inspired gangsta ninja fantasy world. The music however won’t be too Wu-Tang style – it’s gonna be heavily ‘Trap’ influenced. Alot of epic bass drops, sirens, trumpets etc. I really want this to be a game people will get excited about when they hear about it. So I feel I need to make it epic – story and style wise even thought the game itself will probably be quite simple due to my programming limitations and time. 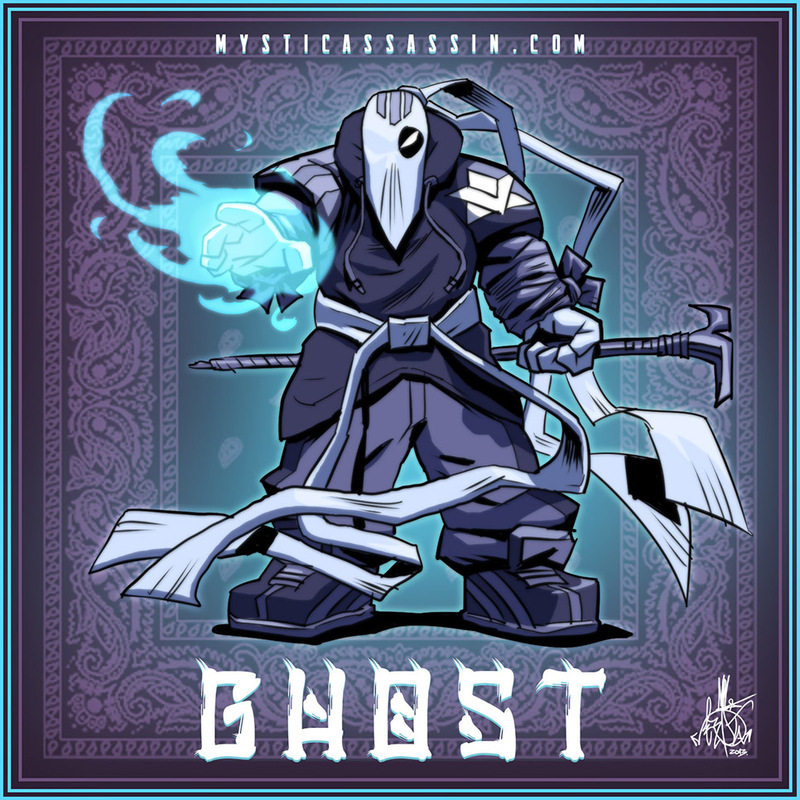 Let’s see where this new train of thought takes Mystic Assassin. Been a while since my last post and the game is slowly evolving. I’ve been toying with the idea of adding a kind of card game as a minigame. Whether or not I’ll go with it only time will tell. I spent most of this week when not working on freelance stuff programming a card game based off of ‘Triple Triad’ from Final Fantasy VIII. I’m thinking today however I should really be cutting features and not adding more. 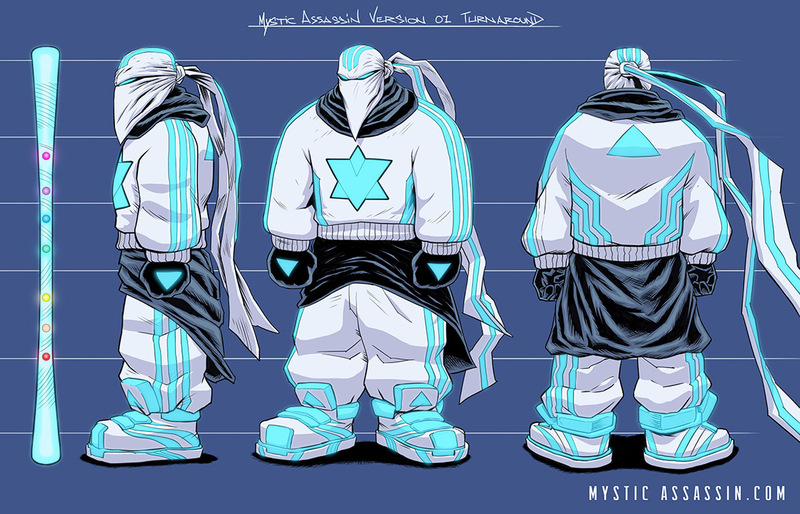 I had the day off today so drew some concepts and then did this model sheet. This version is quite different than the previous design I had which I will post in a future update. Perhaps if the game comes along ok I’ll add some different outfits to the game. 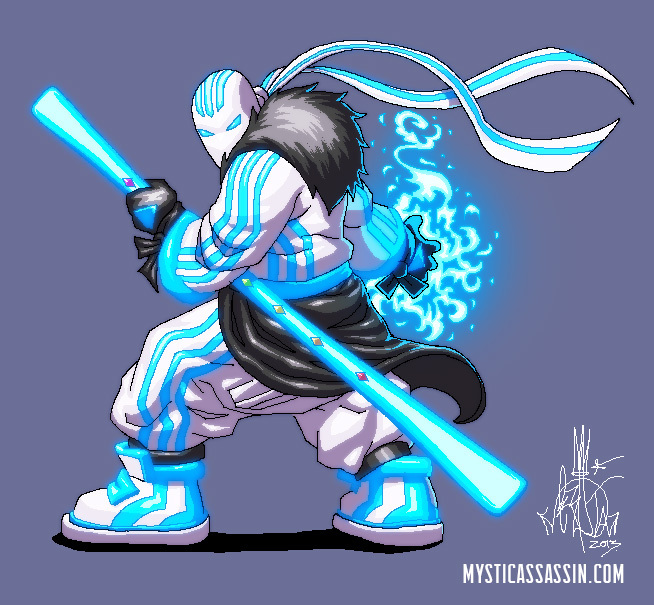 This guy will also have a neon staff which I haven’t drawn into this pic. Finally got a chance to do some coding today. I haven’t done any for about two weeks and it is definitely difficult to get back into it the longer I’m away. I have to go back through and remember where everything is and what it does. It also makes adding and changing things a bit more scary as I’m worried I’ll mess something up. But the best thing is just to dive in. Before long I’m back in the flow and everything comes back. Need to make sure I do a bit of coding each day so I don’t go cold and keep learning. Just fixed a couple of bugs and added in some temp graphics for the player. This helps with seeing what action he is performing and making sure there are no other bugs. Also tweaked the controls a bit to make the slide and attack a bit quicker. Everything looks pretty clunky at this stage but it’s getting there. My next step is to build the temp levels I showed in the previous post and get a proper game happening so that I can start working more on the core game and level design. Copyright © 2019 Chronic Shock Entertainment. All Rights Reserved.